As far as I can see Trump does not honour handshakes or contracts. N.B. the amount of times his companies have gone bankrupt, ruining his creditors. The same man supports white supremacists and nazis, Putin, separation of children from their parents and is anti PRO-life. The supreme mysogonist... and still some speak good of him. There are plenty of people without sin. Most people are much better people than Trump. Trump empowers pondlife. There’s nothing good about the man, he gets the worst out of people. If Sadiq Khan cares to take the Highway east from Tower Bridge, then the M11 north, in a little over one hour, just north west of Cambridge, he will arrive at the American War Cemetery at Madingley. In that immaculate and peaceful place, he can reflect on the 3,812 graves of American citizens who bravely helped in our fight for freedom. For that reason, I, like many, feel his endorsement of this puerile protest slights not only the office of President, but also the American people who voted for him in that election, irrespective of my views on President Trump. 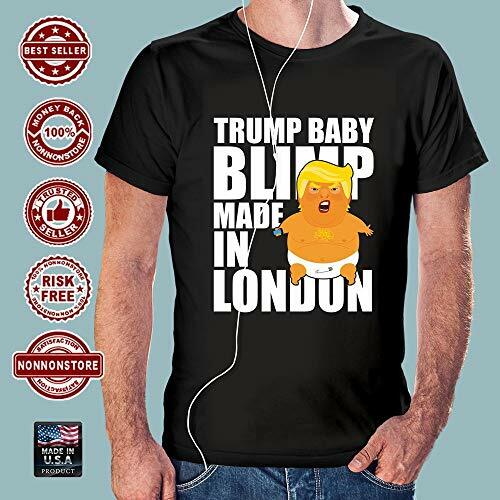 I wish Sadiq Khan had given permission for the baby blimp to fly higher than 60 feet above Parliament Square so that most of London could see it, and perhaps the media in the USA will publish it along with the truth of demonstrations, except Fox News of course. I do hope the sick sycophants are ignored totally. And I trust the sick sycophantic mysandrists and their ilk... will be ignored also!!!! The citizens of the USA can be rightly proud of their fellow countrymen who took up arms against the Nazis and in doing so lost their lives, as we can be truly grateful for their sacrifice. The protest with the blimp is aimed not at POTUS. You will have, of course, noticed that the Stars and Stripes are blatantly omitted. The protest is aimed at the man who, unlike the war dead, stands alongside Nazis and White Supremacists with the fine words 'There are good men among them'. The man who dodged the draft with a hook on his heel. Does a draft dodger honour the war dead or insult them by indicating he believes his life is more important? My American friends have already emailed me with their apologies and sympathy for this visit. Of course they are part of the majority electorate that did not vote for Trump. Oh come off it. We always honour all those who helped us in our fight for freedom. Our freedom means we don’t have to bow in deference to every US President, especially not one that doesn’t seem to possess any of the values represented by those who helped us fight for our freedom. This submissiveness to a POTUS who empowers those who our ancestors fought for the sake of freedom is ridiculous. I didn’t like Reagan, Clinton or George W., but Trump is no POTUS. Personally, I think he’s an insult to everything our veterans stand for. Hear hear. Trump empowers the followers of the ideology our ancestors fought and defeated to preserve our freedom. Supporting this man is digraceful and disrespectful to those who made the ultimate sacrifice. The guy's a thug and brings dishonour to his country. I bet Sadiq now wishes he'd given permission for a fleet of blimps above the capital.